Clickfunnels Review 2019 : Is Clickfunnels Worth the Price Tag? Clickfunnels is a popular landing page, sales funnel builder and all-in-one hosted solution that will enable you to create highly optimized landing pages and sales funnels. This powerful tool is packed full of features and functionality, proving everything you need to promote, sell, and deliver your products and services. But Clickfunnels also comes with a hefty price tag. So is it worth the money? Clickfunnels was created in 2014 by Russell Brunson and Todd Dickerson, and is now worth over $360 million. Originally designed to take the time and frustration out of producing sales funnels, Clickfunnels enables users to quickly and easily create numerous sales funnels, and all without needing any technical expertise. Clickfunnels is an impressive solution and an ideal tool for online businesses, startups, and entrepreneurs alike. Whatever your goals, whether you are looking to collect leads, promote your services, or sell products, you can increase your conversion rates with Clickfunnels. Clickfunnels provides a range of pre-made sales funnels, landing page templates, and an intuitive drag-and-drop editor, providing a smooth funnel design process. Clickfunnels also boasts an impressive knowledge base, and extensive support documentation, helping users navigate this platform and get the most out of the features available. Clickfunnels is an all-in-one hosting solution that will host all of your landing and sales funnels for you. As part of the service, Clickfunnels takes care of all security and maintenance issues, ensuring that your web pages load quickly and suffer minimal downtime. Each sales funnel comes with a video explaining what the funnel can be used for and an extra description sharing top tips on how to get the best results using that specific type of funnel. You can also create custom sales funnels, catering specifically for your individual online objectives. 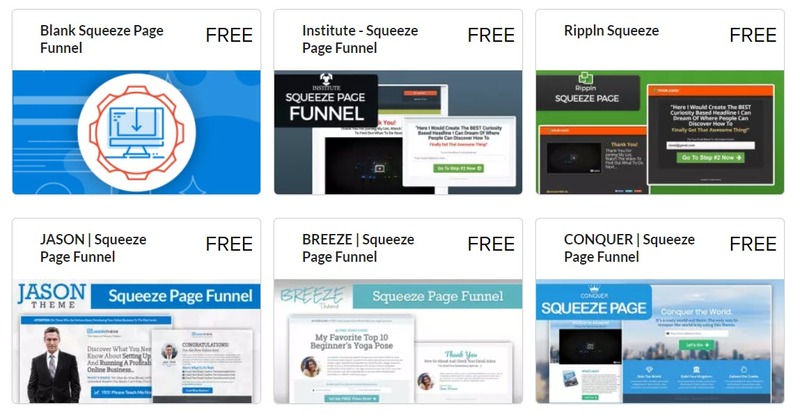 Clickfunnels has a library of free and premium landing page templates for you to select from. These landing pages are all fully optimized and created to convert, ensuring they engage with your users and help you achieve your goals. 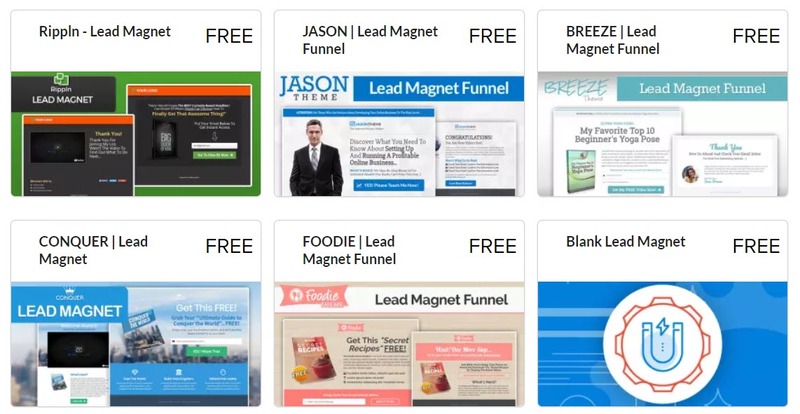 Clickfunnels is a landing page builder that knows what converts customers and what doesn’t, so using these templates will give you a massive advantage over your competitors. Sales funnels are extremely easy to create with Clickfunnels due to the intuitive drag-and-drop editor. Built to make the creation and design process a fun and smooth experience, with the Clickfunnels editor you won’t need to touch a line of code. Simply click on a page element to resize it or move it around the page. So even if you are new to web design, you will quickly be able to produce professional and stylish sales funnels. Content Blocks – Choose from a variety of content blocks that can be easily dragged and dropped onto your sales funnel. These include an FAQ section, pricing table, timer, progress bar, and much more. Media – Select and add images, video, or audio to your sales funnel. Images can be uploaded, or you can search for a stock image from the Clickfunnels library or from Pixabay, IconFinder, or Unsplash, all without having to leave the editor. Videos can also be embedded from YouTube, Vimeo, and Wistia. Fonts – Choose from one of the many Google fonts for your content and headlines, alter the color, change the size, and more. Background – Select background colors, images, or videos for your sales funnels. Forms – Within the editor, you can add a number of advanced form types to your funnels. These include an SMS sign up form, survey form, and shipping and billing address forms. 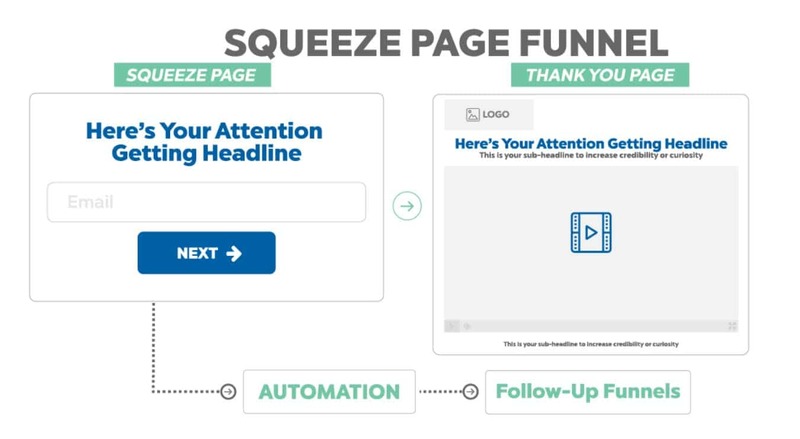 Popups – Add attention-grabbing popups to your sales funnels, select where and when to display them, or set them to appear as your visitors go to exit the page. Social Media – Display social share buttons, Facebook comments, or a Facebook sign up button anywhere on your sales funnels. The style of buttons can also be altered to suit your branding. SEO – Add metadata to your funnel, including keywords, title, description and more, then view your search engine snippet. Custom CSS – For those of you confident with coding, you can add your own custom CSS styles to your page (this isn’t mandatory but a nice extra for those who want it). 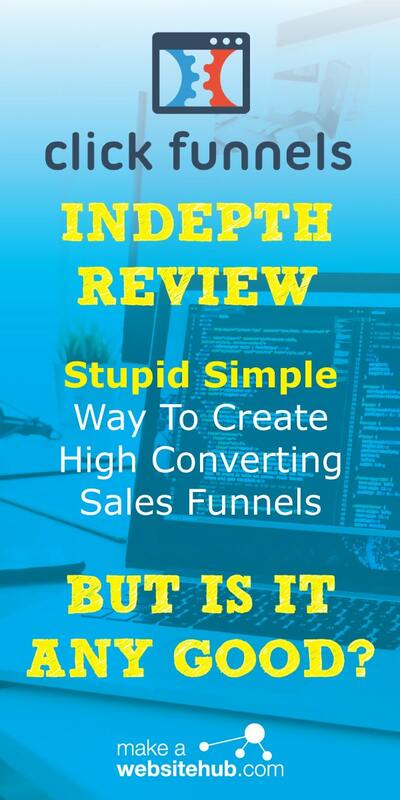 As you can see, the Clickfunnels editor offers much in the way of usability, tools, and features, ensuring that, you create stunning and highly converting sales funnels. Clickfunnels is a great solution to help increase sales. By promoting your products using a multi-stage sales funnel, you can showcase your products, generate interest, and clinch the sale. With Clickfunnels you can sell both digital and physical products. Clickfunnels also integrates with ShipStation, an eCommerce fulfillment center, which will take care of all the time-consuming packing and shipping. So whatever your eCommerce preferences, Clickfunnels will have something to cater for your needs. Design your own custom affiliate plans. Create different types of affiliates (ie – Regular affiliates, Super affiliates, Friends and Family, etc). Create a two-tiered affiliate programme (ie – let affiliates recruit affiliates). Backpack is offered as part of the Clickfunnels top-end Etison Suite plan (pricing options will be covered further on in this review). The Clickfunnels membership funnels have been created to enable you to sell access to your membership site, or premium content areas. A membership funnel starts with the promoting of your site, demonstrating top content and explaining why users need to subscribe. This then funnels down to a signup page and access to content. Clickfunnels provides complete fully-functional membership funnels and landing page templates to increase sign-ups to your site. Or alternatively, you can build a custom membership funnel from scratch using a blank template. With Clickfunnels you can create webinar funnels to help you grow your brand, sell your products and spread the word about your services. There are two ways you can run a webinar with Clickfunnels. Firstly you can host a live webinar using a service like GoToWebinar or Zoom. You can then use a Clickfunnels event funnel to customize the registration process and increase attendance. Alternatively, you can produce a pre-recorded webinar that Clickfunnels can then play on-demand, automatically running the whole webinar process for you. Clickfunnel integrates with a number of popular email responders, including Aweber, MailChimp, Salesforce, Hubspot, and many more. However, Clickfunnels also offers its own marketing automation platform, Actionetics, which is available on the Etison Suite plan. As you can see, Actionetics has an impressive feature run down, making it easier to connect with your customers on a personal level. Monitoring your analytics will help you understand what your customers are responding too, and help you plan changes and improvements for future funnels. Clickfunnel’s a/b testing abilities is up there with the best of landing page builders on the market. Clickfunnels provides impressive support for their users in the form of an extensive knowledge base. This knowledge base is very well laid out and organized, enabling you to quickly find the support documentation you need. 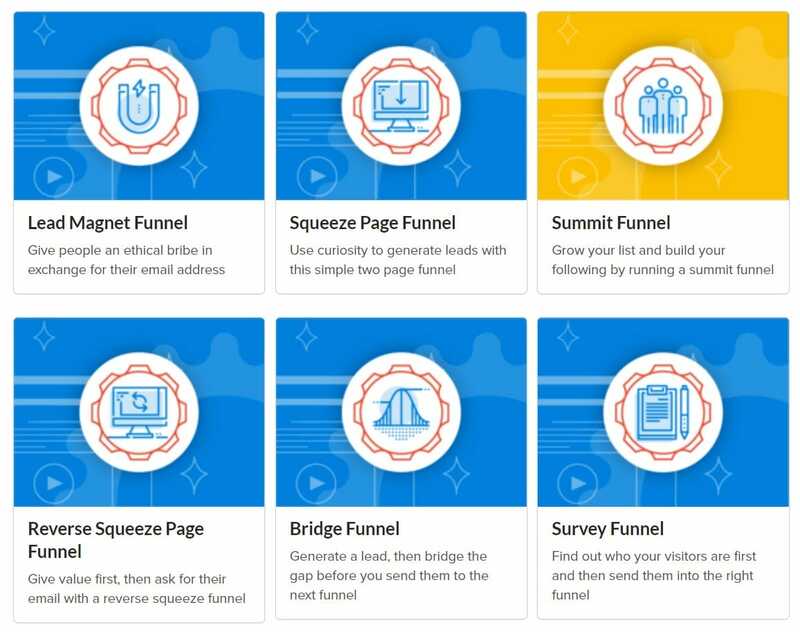 As well as the knowledge base, throughout the Clickfunnels dashboard there is a wide assortment of help videos and descriptions, sharing best practices, explanations of tools, and top tips for using the numerous Clickfunnels features. Clickfunnels also promotes a strong community, both on their website and on Facebook. A Community support forum, found via the knowledge base, helps users connect and discuss any problems, questions, or queries. The Clickfunnels Facebook page, which is currently followed by nearly 200,000 individuals, is also another great place for inspiration and interaction between Clickfunnel users. Clickfunnels has also created an active YouTube channel, packed full of informative videos helping users to get the most out of their product. And if you still can’t find the help you need from one of these many support venues, then you can submit a question to the Clickfunnels help team. To register with Clickfunnels, open their homepage and click on the Start Your 14 Day Free Trial link. Use this link to get started. Once you have filled out the necessary details and credit card info, your account will be created and you will arrive at the Clickfunnels dashboard. Profile – Edit your picture, email address, password, and other personal information. Timezone and Language Settings – Check the timezone and language are both correct for your location. Affiliate Settings – Here you can find and share your affiliate ID (you can earn up to 40% commision through affiliate sign-ups to Clickfunnels). Browse all other Account Setting details by using the menu on the left-hand side of the page. The second step to setting up your Clickfunnels dashboard is to manage your integrations. Again, select your avatar from the top right-hand corner of the screen and then click on Integrations > Add Integrations. The third-party integration options will then be displayed in alphabetical order for you to select from. Autoresponder – Choose from one of the many third-party autoresponders (MailChimp, Aweber, and many more). If you are an Edison Suite user, here you will need to select Actionetics to integrate it with your Clickfunnels account. Integration with your email marketing activities is paramount. Payment Gateways – Again there are numerous payment gateway options to choose from (Strike, PayPal, InfusionSoft, etc). Make sure you are clear on the terms, conditions, and fees of your payment provider before set up. Outgoing SMPT – This is the system Clickfunnels uses to send transactional emails, like receipts and shipping notifications. To register an SMPT service, simply select Outgoing SMPT from the left-hand side menu. To integrate any of these third-party services, simply click on the application, then follow the install instructions. For each process, Clickfunnels provides support material, so if you aren’t sure on an integration set-up, check out the knowledge base. Before you create any sales page / sales funnels it is also important to set up your domain. Select Domains from the drop-down avatar menu, and then Add New Domain. Register a New Domain – Clickfunnels gift users their first domain for free (for the first year). Extra domains will cost $20 a year. Add Your own Domain – Easily add a domain or subdomain that you already own, or buy one from a good domain registrar. Whether you are connecting your own domain or creating a new one, simply follow the instructions to complete either of these processes. The Classic Funnel Builder – Select a goal, choose a funnel type, and then build your funnel. Funnel Cookbook – Take advantage of the pre-made funnel templates created by Clickfunnels. 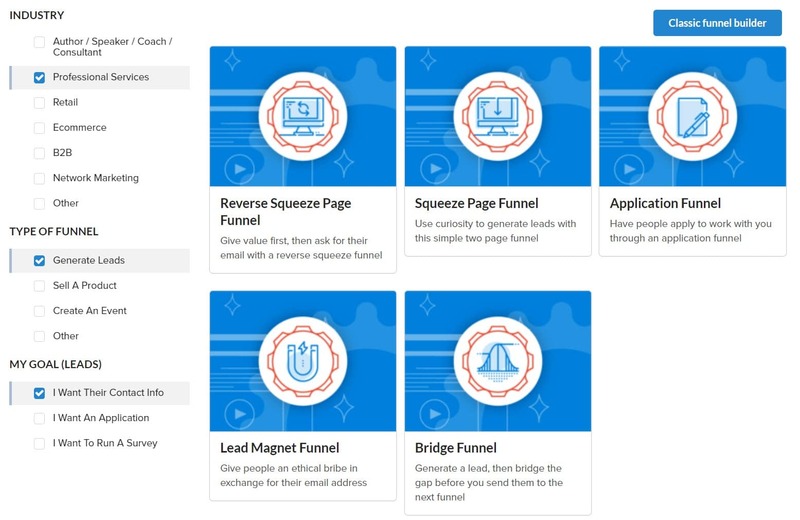 On the Clickfunnels dashboard, select + New Funnel. Once you have made your selection, you will find a video and an explanatory text. These give you advice on how to best use your chosen funnel. On the right-hand side of the page, you can also see how many pages your funnel has, and view a map of the funnel. The second step of the Funnel Cookbook is to select a template for the funnel set you have chosen. There are both free and premium templates, which can be viewed before you make a decision. These templates are all 100% customizable, so you can go ahead and just select the template that is the closest fit to your needs. Edit Page – Click to edit your funnel. Settings – Configure your funnel’s settings. Funnel Steps – View your funnel’s pages and add more. Launch Checklist – Check what steps need completing before launching your funnel. Automation – Send emails or SMS messages to new contacts. Contacts – View new contacts collected. Stats – View your funnel’s stats. Before you edit the content of your funnel, it is important to customize the settings. Click on Settings in the top right-hand corner of the dashboard. Domain – Select the domain name you would like to use for your funnel. Path – Select the path of the domain for your funnel (eg – www.mysitesname.com/home). SMPT Configuration – Select the SMPT configuration that you set up under Integrations. Favicon URL – Upload your own custom favicon for your funnel pages. Head and Body Tracking Codes – Add any site-wide tracking codes here (eg – Google Analytics pixel). The Clickfunnel knowledge base provides further information on customizing your funnel settings if you should need it. Click back onto the Optin page of your funnel, found in the left-hand side menu of the Clickfunnels dashboard, and then select Edit Page. Your lead generation funnel will now open within the Clickfunnels Editor. Mobile/Desktop View – Check out how your funnel looks on both mobile and desktop devices. SEO Meta Data – Under Settings > SEO Meta Data you can add your funnels SEO details, including title, description, keywords, and more. Background – Under Settings > Background you can change the background of your funnel by altering the color, or adding an image or video. Sections – Add, copy, and manage your funnel sections. Here you can change section settings, as well as select from pre-made sections. Elements – Drag and drop pre-made elements onto your funnel from the Elements tab. Add forms, media, content blocks, and much more. All elements can be drag and dropped around the page, and settings can be altered by clicking directly onto the specific element that you want to edit. Within the editor, you will also need to integrate your SMPT service with your funnel. To do so, select Settings > Integrations, and then select your SMPT service from the drop-down menu. Take your time familiarizing yourself with the Clickfunnels Editor, then customize your funnel to your exact specifications. Your funnel should now be complete and ready to share. Open your funnel’s URL to check that you are happy with the appearance of your funnel, and importantly test that it works. Clickfunnels then makes it very easy to share your new funnel on your social media channels. WordPress Plugin – Install the Clickfunnels plugin on your WordPress website to easily add your funnel to a page or post on your site. Embed Code – Use code to embed your funnel on any page of your website. Download HTML – Download the HTML file of your funnel pages to host anywhere. Clickpop Code – Add a popup version of your funnel anywhere on your website. Add to Facebook – Display your funnel on your Facebook page. Clickfunnels ($97 a month) – On this basic plan you can register three domains, create 20 marketing funnels with 100 pages, and receive up to 20,000 visitors. You also get access to all the editor features, pre-defined funnel sets and templates, email and eCommerce integrations, and much more. Etison Suite ($297 a month) – This package gives you unlimited access to all the Clickfunnels features, and allows you to create as many domains, funnels, and pages as you need. The Etison Suite also gives you access to both Actionetics and Backpack. 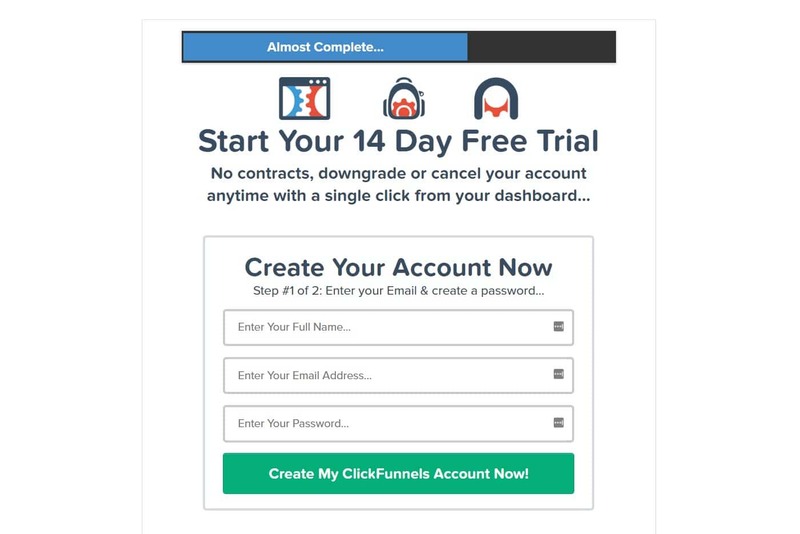 Evidently, Clickfunnels isn’t cheap, so before you make a decision on whether this is the right tool for you, take advantage of its 14 day trial. If you sign up to Clickfunnels as a paying customer and you’re really happy with what you’re getting for your money, then why not spread the word! Clickfunnels has a very attractive commission structure for affiliates to make a lot of money by promoting Clickfunnels. The great thing about their affiliate platform is that they provide their affiliates with everything they could possibly need to effectively promote Clickfunnels. These range from banners ads, pre-written email campaigns templates, customized landing pages and so much more. There’s a lot of money to be made in affiliate marketing, especially promoting products with high commission tiers like Clickfunnels. For more information on the Clickfunnels affiliate program take a look at their affiliate offering here. There is no doubt that Clickfunnels is an impressive tool that could potentially make a big impact on any business. Packed full of tools, features, and functionality, whatever your goals, Clickfunnels can help you increase conversions and make money. Although expensive, if you have the budget for this tool and want to see your business grow, then Clickfunnels is worth the investment.